Qualitative or formative research is an activity conducted at the start of the Social Behavior Change Communication (SBCC) project design process. Qualitative research is a key step in order to create program materials, tools and approaches that are culturally appropriate given the local context. Qualitative methods collect data and answers questions such as why and how and, although it provides rich detail, it is not meant to generalize to an entire population or intended audience. Qualitative research is used to gain insight into the health issue or behavior the project intends to address; relevant characteristics of primary and secondary audiences; communication access, habits and preferences; and the main factors that hinder and drive behavior. Qualitative methods may be used when program planners need to get an understanding of the attitudes, habits and behaviors of their audience but do not need to estimate the proportion of the attitudes, beliefs or knowledge levels in the population. It is critical to conduct qualitative research before implementing any SBCC program because without it you cannot know your intended audience, their current level of knowledge, their beliefs and attitudes, the channels through which they receive and act on information and the barriers to adopting new health behaviors. Any program development must begin with the audience and not be designed in isolation, removed from the intended audience. Who should Conduct Qualitative Research? Qualitative research should be developed by the research staff in close collaboration with program staff and any government or NGO counterparts who are designing the program and have clear knowledge of the program goals and objective. Once designed, using qualitative methods requires certain skills in interviewing or conducting group discussions and an understanding of what the program needs to know about its audience in order to design appropriate strategies and materials to achieve the intended results. When should Qualitative Research be Conducted? Qualitative research is conducted at the beginning of SBCC programs and can help researchers and program managers discover and explore themes or processes, provide personal narratives and uncover attitudes or ideas that are common among members of a population. However, this method cannot be used to determine the proportion or number of people in an intended audience who think or act in a particular way. How is qualitative formative research conducted? Two of the most common approaches used in formative research are focus group discussions (FGDs) and in-depth interviews (IDIs). These methods are effective for gaining insight into what motivates individuals and communities to behave a certain way and how they view the world or the community around them. Both focus group discussions and in-depth interviews can reveal vital information that can help shape future quantitative research or they can be used to dig deeper or reveal additional insight into existing quantitative data, such as survey results. FGD or IDI: Which one to use? The reasons for using a focus group discussion or an in-depth interview are quite different. Researchers will often opt for a combination of FGDs and IDIs in an effort to comprehensively study the population and their beliefs, attitudes and behaviors. Although the pros and cons of using FGDs or IDIs are different, the process of creating, executing and analyzing FGDs and IDIs are similar in some regards. The steps below can be applied to the development of both methods for conducting formative research. What are the main health issues to be addressed by the program? What is already known about the issue and the audience? For example, what is already known about the factors that drive or hinder behavior among members of the intended audience regarding the health issue being addressed? What other information is needed in order to create your SBCC strategy and program? How will the information gathered from this group discussion or interview be used to define a strategy, to create materials, to set priorities, etc.? What information is needed from participants that can inform decisions related to the design or implementation of an intervention? Describe how women search for information about family planning methods. Determine the process men and women follow to decide whether or not to use family planning. Identify reasons why women do not talk to their husbands about family planning. Clarify how peer relationships affect family planning decisions among teenagers. Relevant to the goals of the program and to the audience? Feasible to discuss in an interview or FGD? Drop or rewrite any that are not Specific, Relevant and Feasible. Put the objectives into order of importance. Which need to be answered first for program decision-making? Which are useful to know but may not be as essential? Who to recruit for FGDs or IDIs depends on the topic and, especially for FGDs, the sameness of the participants. Some topics may be important only to a specific group of people. For example, a study on breastfeeding practices will not be relevant to women who have never breastfed. Family planning, on the other hand, is an issue of some relevance to both married men and women but not to unmarried men and women. In the breastfeeding example women who are currently breastfeeding might have different attitudes, knowledge, and practices than women who breastfed years ago. If both subgroups of women are part of the intended audience, then more discussion groups or interviews may be needed to understand the differences between them. Identifying the right respondents is key to gaining insights and information that are relevant to your planned intervention. The number of FGDs or IDIs that need to be conducted depends on a number of factors including the sameness (homogeneity) of the participants and saturation of the responses to more completely understand the issues. 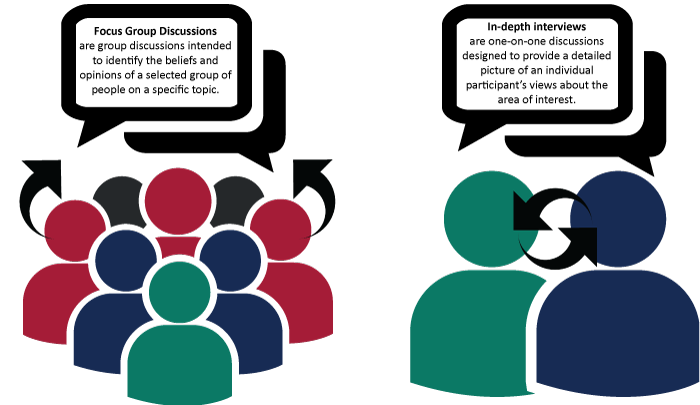 When determining how many FGDs or IDIs to conduct, consider the demographic composition of your intended audience. Develop a list of key attributes that represent the study’s intended population. If the target group is urban poor women, ages 15-24, then the FGDs or IDIs should consist of people who fit those criteria. Remember to think through different demographic factors that can affect the behaviors you are trying to influence and form the number of groups or interviews accordingly. When putting together FGDs, it is important to consider the size of the groups. On average, 6-12 people participate in each FGD because fewer than six participants produce less than a critical mass of discussion and interaction; groups larger than 8-10 people can be hard to manage and it can be difficult to give everyone a chance to voice their opinions. If the sample of participants is more heterogeneous (i.e., group members have different attitudes, levels of knowledge or experience with the issue or are geographically or demographically varied), more FGDs or IDIs will need to be conducted in order to capture all of the different perspectives. If the sample is more homogenous similar attitudes or demographics with regard to the health issue), fewer FGDs or IDIs will be necessary since a more homogenous population often produces a smaller range of views and opinions. 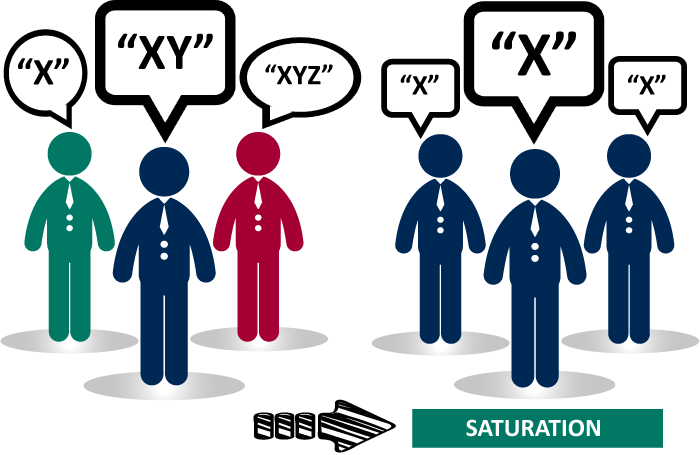 Saturation refers to the point in the research process when all the viewpoints and information about the issue have been voiced already by participants. Saturation occurs when the last or final IDIs or FGDs do not reveal any new insights or ideas that were not mentioned in previous interviews or discussions. 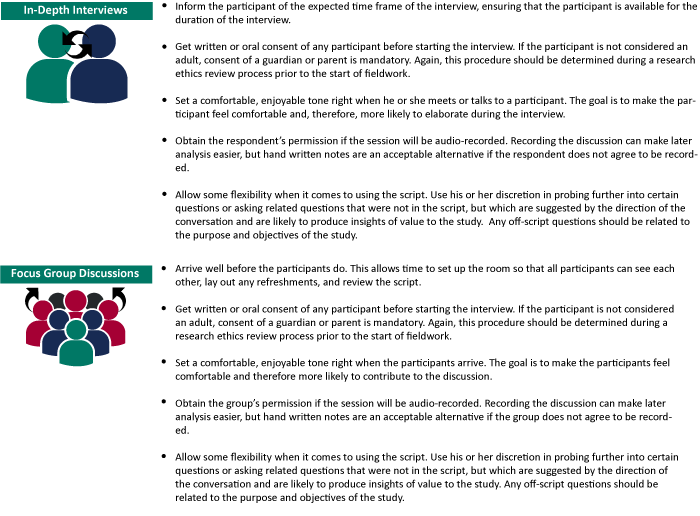 Unless the research must explore the views of many different subgroups, most formative research studies conduct no more than 10 FGDs or IDIs before saturation is achieved. At that point, if the discussions and interviews are still producing new insights, then more sessions may be necessary. Begin by drafting a list of questions that match the research objectives. Once the questions have been drafted, review the purpose and objectives of your study. Narrow the list of questions to the ones that are most relevant and important for the research, ideally 7 to 10 questions, keeping in mind that each question will be followed by additional probing questions. You may list some probing questions to keep at hand and use depending on the direction that the discussion or interview takes. The probing questions go deeper into understanding the underlying causes of the issue or behavior being discussed. Do not overload the discussion guide with too many questions. A FGD will generally last for 1 to 2 hours and an in-depth interview is usually shorter. Remember that the goal of qualitative research is to go deep into a few key ideas, not to cover a lot of topics superficially. Questions should be open-ended (i.e., they cannot be answered simply “yes” or “no”) in order to invite ideas and stimulate conversation. Ensure that the questions are not biased and do not have language that might encourage participants to answer in a specific manner. Once the questions have been refined, arrange them in order so that they begin from the more general to the specific and in a way that will be comfortable for the participants. The first one or two questions should be simple introductory or warm-up questions that put the respondents at ease, help establish rapport between them and the interviewer, and lead into the more serious questions. Facilitators or moderators lead FGDs and interviewers are used for IDIs. Effective FGD facilitation requires a special set of skills that not all facilitators have. In an FGD, the facilitator must ensure that all participants share their opinions and interact with each other. An additional person who can take notes on the discussion is also important so the facilitator is free to moderate the discussion. Effective interviewing requires its own set of skills in creating personal rapport and trust that will enable the participant to honestly share his or her opinions and feelings. Both facilitators and interviewers should be able to diplomatically keep the discussion on track and ensure that every participant is heard. They must be open-minded, flexible, patient, observant and good listeners and ensure that they do not lead or influence the conversation. They need to be able to capture and build on trends in the conversation and use active and reflective listening. They should also be deeply familiar with the study topic and the larger project objectives so that he or she can help keep the conversation centered on the purpose and needs of the study. Facilitators or interviewers may be staff members, volunteers or third-party professionals, but in any case must have strong interpersonal communication skills, even though their interaction with the participants relies heavily on a script. An opening. Create an opening statement for the facilitator, where he or she will welcome the participants, introduce himself/herself, present the purpose of the study, explain how the focus group or individual interview will work and ask for brief introductions from the participants. If required by a research ethics board, this script may also include the language needed to obtain the informed consent of the respondents to participate in the research. Questions. This part of the script consists of the questions created in Step 5. Remember to start with the introductory questions as a way of comfortably easing participants into a more serious and in-depth conversation. Closing. When closing, the facilitator should summarize some general themes and insight that came out of the conversation and give participants an opportunity for any final words, thank them for their input, inform them how the data will be used and explain how the results will be disseminated. Once the FGD or IDI is over the facilitator or interviewer should immediately write down any impressions or observations made during the discussion or interview that might help the analysis. The audiotape of the discussions should be carefully transcribed and, if needed, translated. The facilitator is not required to do this, but if a third party provides that service, the facilitator should verify the accuracy of the transcriptions before they are subjected to analysis. The quicker an FGD or IDI is transcribed, the less likely there are to be mistakes due to lapses in the facilitator’s memory. Once the FGDs or IDIs are transcribed, they should be analyzed and coded for common themes related to the purpose and objectives of the study. Arranging or grouping the statements by theme allows for better organization of data when pulling out results and key findings. These findings should be put into a report that details the methods of the study, the key results and findings of the discussions and/or interviews, and the resulting implications as they relate to the design of the health campaign or program. This qualitative formative research process and the resulting report will allow partners and key stakeholders to gain a better understanding of the target population, especially with regards to the health topic of interest. Once the formative research is complete, it is time to start considering the type of intervention the target population needs as well as what monitoring and evaluation system should be put in place in order to assess whether or not the population’s needs and interests are being met and to ensure that the program is on track. Some health topics may be too sensitive or inappropriate for certain populations or groups to discuss in public. Adjust objectives or methodology accordingly. For example, it is sometimes inappropriate to discuss contraception in a mixed group of men and women together. Consider, instead, having separate FGDs for men and women. 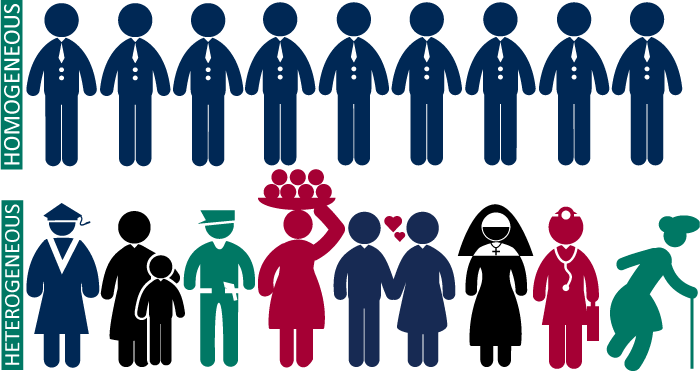 Statistically representative means that the numbers produced can be understood to reflect the whole intended audience of an SBCC program and not just the people who participated in the research.For example, For example, a audience survey might find that out of 1000 young married women aged 18-24 who were interviewed, 200 of them (20%) reported searching for health information on the internet in the past month.If those 1000 respondents were selected in an unbiased way (usually some kind of random sampling), then we can assume that they represent the entire audience and we can confidently expect the same rate of health information seeking (20%) among all young married women aged 18-24. We often need to calculate proportions of the audience with certain attributes in order to prioritize what the program should focus on. CARE. Window of Opportunity Formative Research Field Staff Toolkit. Gittelsohn, J., Steckler, A., Johnson, C. C., Pratt, C., Grieser, M., Pickrel, J., and Staten, L. K. (2006). Formative research in school and community-based health programs and studies: “State of the art” and the TAAG approach. Health Education & Behavior, 33(1), 25-39. Lehigh University. Conducting a Focus Group. Oak Ridge Institute for Science and Education. Steps for Conducting Focus Groups or Individual In-depth Interviews. Overseas Development Institute. Research and Policy in Development: Focus Group Discussion. Pathfinder International. Conducting In-Depth Interviews: A Guide for Designing and Conducting In-Depth Interviews for Evaluation Input.